Cover Love at Romance Lives Forever is a short intro to a book and includes a cover, blurb, buy links, and social media contacts for the author. Today's featured book is Into the Magic by Naomi Bellina. 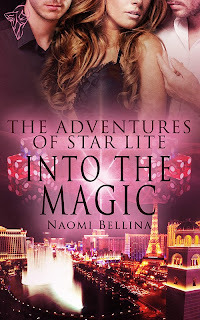 Star Lite exercises her emerging magical talents to search for Adam, the seductive stranger who captivated her heart during an extraordinary adventure. Her every sense tells her they are meant to be together, yet he has disappeared. Certain he's in danger, she tracks him down and they meet in Las Vegas, where emotions flare and flames ignite. But Adam must complete a mysterious mission and sends her away. She uses the time waiting for Adam to study with Tristan, a passionate magician with secrets of his own. As Star's powers are unlocked, she questions the rulings of the authoritarians who control magic. Against Tristan and Adam's warnings, a premonition moves her to go back to Vegas. There, a new facet of her power puts her life in peril. For protection, Tristan, Adam and Star engage in a sizzling ménage ritual. Join Star as she opens her heart and soul to love, and continues her journey into the magic. Thank you so much for having me here today, Kayelle! This is one of my favorite covers of all time so I'm delighted to share. You're welcome! I love the bright pink.